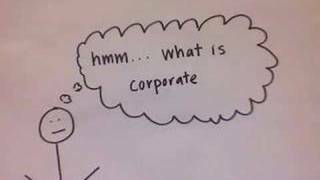 Corporate finance is the area of finance that studies the sources of funding and the capital structure of corporations and the how to use the money to add maximum value to the shareholders' wealth. Models for calculating costs of stocks and costs of debt. Decisions about whether to give a dividend or to reinvest that money in business. 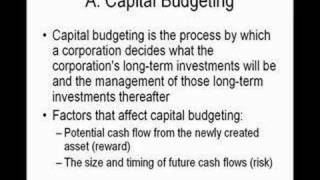 Working capital management: management of inventories, receivables and cash. Calculation of investment performance valuation parameters such as ROI, ROE, etc. Raising: Corporate finance includes collecting finance for the company. It is very difficult for new companies to collect finance because the investors do not have confidence in new companies. However, it is very easy for reputed companies to collect finance due to their well-established reputation. Investing: The collected finance is invested to achieve the objectives of the company. It is used to purchase fixed assets. It is also used for running the company. The finance must be used profitably. Objective oriented: Corporate finance is used to achieve the objectives of the company. This is, to earn maximum profits, to give a proper dividend to the shareholders, and to create a proper reserve for future expansions, etc. Relationship with other departments: Corporate finance has a close relationship with all other departments in the company like production or marketing departments, etc. This is because all departments need finance continuously. Dynamism: Corporate finance is dynamic in nature. It changes according to the circumstances, times, etc. So, the finance manager must use new and innovative ideas for collecting and investing money. Finance is one of the most important parts of a business. It is required by all types of companies. It is required for starting and running company. It is required for the survival, stability and growth of a company and also for the expansion and diversification of a business. So, nowadays a company cannot survive without finance.